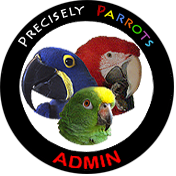 If you are new to Precisely Parrots, you may wish to review our Terms of Service policy and our Rules and Etiquette guidelines, both available from the Policy & FAQ tab above. Our Frequently Asked Questions section is also available from that tab, or by clicking here. Additionally, please be aware that you must register in order to post messages in our forums. Simply click here to proceed. To begin viewing messages, you may click on a forum from our forum list below. Thanks for your interest in our parrot owners community! ATTENTION! Please DO NOT use an email address from either yahoo.com or aol.com to register a new member account at Precisely Parrots Companion Bird Forums. Unfortunately, mail services for those two domains have been unjustly blocking traffic from many legitimately reputable email servers, including our own. If you register a member account here using a yahoo.com or aol.com email address, you will be unable to receive the auto-generated email message from us containing your account activation link that is necessary to complete your registration. If you are concerned about receiving all important email sent to you by various Internet services and mail servers, please realize that at the current time yahoo.com and aol.com mail services are unreliable. For questions, please use the Contact Us link at the footer section of this page. A friend of mine has a very cool Kookaburra(Australian king fisher, more of a carrion bird though) named Sid, short for Sidney. 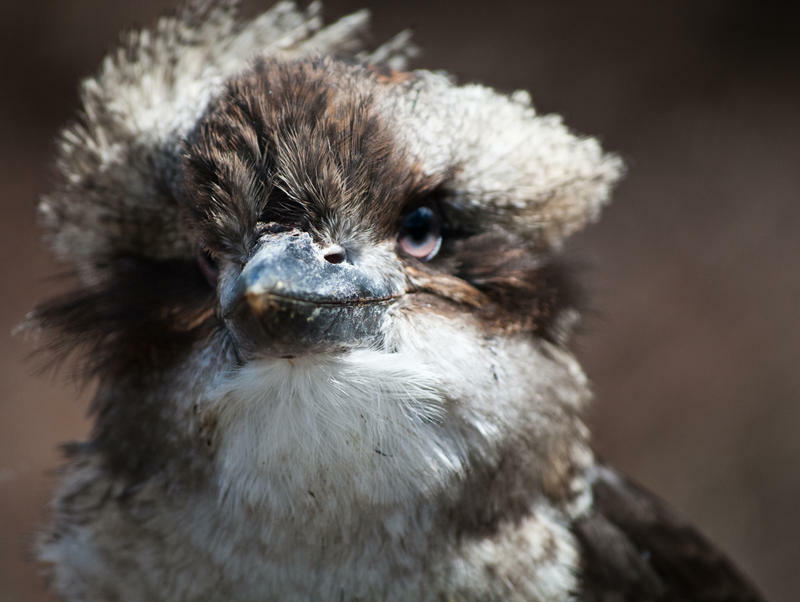 He came from a aviary with other young kookaburras who were beating him up so my friend got the chance to buy him. Babies are available from the Corvid Ranch, but you need a exotic permit in most states. He's pretty awesome, but is kind of hard to read. He's extremely soft and I love to pet his fluffy head. Sid lives outside in a Mew/aviary, two of his favorite foods that he gets daily are pre-killed mice and thawed quail pieces. He also has a small aviary with Homer pigeons, He uses them in falconry(not to be eaten). I love the homers, they are so cool. When he opens the door in the late morning there is a rush as they all fly out and fly in a flock up in the sky before returning. This is one of the adorable babies I got to hold. Last edited by Copper; 04-20-2013 at 11:55 PM. i love the kookaburra, they have to be one of my favourite wild birds. beautiful pics. Awesome..thank you for sharing them! This was really cool to see and hear this beautiful bird! I can only imagine how loud they are in person. Willy-Eclectus, Oliver-alexandrine,Mookie-Senegal,Bella- Australian King,Joey and Peewee- Barrabands, Peachiegirl-Peachfront conure,Pepper- crimson belly conure, Peanut-plum head, Babyblue-parrotlette, Harry and Louie-canaries. I didn't realize how big they are. I love the call and I can just imagine how loud it would be in an enclosed environment. Blue & Gold Macaw "Jack", Military Macaw "Maynard" - RIP, Hyacinth Macaw "Zaffer", Green-wing Macaw "Salsa", Nanday Conure "Bozley"
"Please never place your popularity above the safety of a feathered companion!" All times are GMT. The time now is 08:57 PM. Copyright © 2013-2019 PreciselyParrots.com. All rights reserved. This website is dedicated to the late Terrie Morris (1958-2012).